AHHHH. Finally, here it is. Lishuoscho Kivinu. Time to write my review. As if I don’t have anything better to do on a Friday afternoon 2 hours to Shabbos. But, I just finished listening to it, and the time to strike is while the iron is still hot, and I’m still overawed by the sound of this thing. First of all, a few preliminaries. A couple of words on the voice on this album, Ari Shraga Chaim Goldwag (ASCG!! )… Many of us remember him from his choir days… the way he would stride up to the mike with no fear, no stage fright, no ego, do his piece, and walk right back…. The voice he used to have, even back then, the control over it…. The serious ones among us already felt that this kid had a definite future down the road, just by the unpretentious way that he presented himself. 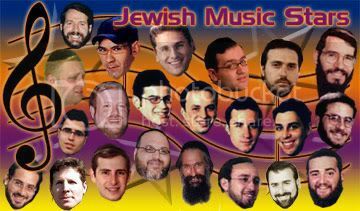 I won’t embarrass Ari by extolling all of his virtues here, but suffice it to say that Ari Goldwag is a special person and a ben torah – one of those rare instances in which a singer is actually a Torah’dige and humble guy and not an ego boy in the industry who finds everyone else beneath him or lets his music get to his head. You all know what I mean. He’s a special and warmhearted human being, a fact which I can personally attest to. :-) (Stop blushing.) Ari is a real Shwekey number 2. Except, that Shwekey can hide under a rock when it comes to Ari’s musical capabilities. As he wrote in his Country Yossi article, this guy composed 10 out of the 11 songs, and he engineered, mixed and produced the entire thing! That is UNBELIEVABLE! For one person to do all of this alone – I can just imagine the crazy hours of sheer hard work he must’ve put into the album. His musical genius just shines through. The album is completely professional – no, don’t mistaken it for Ruach Uneshama II, this is the REAL thing ! – and all done by Ari… wow. As for Ari’s voice (see the irony in this? Lol) – there are mamish no words to describe it. A well known singer who is part of another musical group told me recently after hearing the album, “I really admire Goldwag’s control.” His voice is deep, rich, and as I just said, very controlled. (Kind of like Yehuda, minus the “hot-potatoes-in-his-mouth edge). I mentioned in my Ruach Uneshama review that Ari is really made for slow songs, more than for fast ones, and I see that he took my advice (just kidding). This tape contains a lot of slow, soulful, heartzige songs, as well as a few horas. It only has two or three really fast songs. (This seems to be a new trend.) As for his supposed lisp – I was very puzzled by Yossi’s allegations (oy, I’m getting into hot water here using legal terms with Yossi, eh? ;-)), because on Aleinu, Ari does not have a lisp in his childhood voice, and I also did not notice it on R U either. I listened very closely and realized that perhaps Ari has a slight variation on the way he pronounces his SHHHH sound, but definitely not on the SSSSS. The clips on his site are not so clear. You gotta hear the real thing. It’s amazing, when I was listening, I realized that not a single song here is a “filler” song. It’s not like on many other albums, where there are 4-5 hit songs and the other 6 songs are just abee to fill up the space, typical songs. Every single song was well thought out, every minute of the music, choir, and melody was accounted for. And every single song is a gem unto its own. You’ll see that when you listen to it. Also, Ari provides a short explanation of every song on the album cover, which is a great thing. 1. Lishuoscho Kivinu… this song is very interesting. It’s a cross between a heartzige song and a hora. Maybe that’s exactly what it is – a heartzige hora. The music on this number is really full and rich, and you can’t help but dance to the beat. (Please, no one check if I’m paraphrasing from Ari’s article. Just kidding.) There is some excellent choir work on this one with great harmonies in them. It’s amazing how Ari can take a hora and put his whole heart and soul into it. Well, then again, he didn’t just take a passuk from anywhere and put any music to it; the words themselves belong to a heartzige piece. I’ll assign this song a resounding 10. This track is probably what I’d dub the hit track of the album. 2. Shomer Yisroel. This slow moving, heartzig song was composed by Ari while he was learning in the Yeshiva of Far Rockaway. He was inspired to compose it right after they had said tehillim for a someone in yeshiva. It’s very moving and sung full of heart. It falls more into the typical slow JM category; I’ll rate it a 7.5 (probably much to Ari’s chagrin, because this is probably his favorite slow song. Guess we all have different tastes). 3. Lo Amus. Ahhh. This is the song that made the rounds among half of this group last year, when Ari wanted our opinion on the song. He did change the first half of the song, and it’s great! This is a rousing, lebedigeh number, but even here, Ari manages to infuse it with his pure feeling. I love the music on this song as well, it’s very cute and refreshing. Ari says he composed this because of all of the bad news going on in Eretz Yisroel. In Ari’s words (stolen from his article), “The feeling and emotion expressed in this upbeat song are punctualized by great brass and choir lines, all contributing to a sound that will move and uplift you.” He’s so right. It’s a lebedig song yet very powerful and moving. I rate it another resounding 10. 4. Koh Ribon. This is essentially a “remake” of the Koh Ribon on Ruach Uneshama, but it’s redone BEAUTIFULLY. I recall that when I heard this song on R U, I loved it immediately. Ari only had a small solo or two on the first draft of the song, and he put his whole ruach and neshama into it (pun intended), so I was thrilled to pieces that he redid the whole song himself here on this album. It’s a pleasure to listen to. This is a gorgeous rendition of Koh Ribon, sung with a ton of heart and feeling. The choir work on this is just beautiful. I rate this song a 9. 5. Aleinu!!! AHHH! My absolute hands down favorite song on the album, which I was craving to hear for the longest time. There is something so special about this song. It’s so simple, and so sweet and endearing that it just warms your heart. It’s a real time warp, especially for those of us who were Ari’s fans in the 90’s. (Actually, I was not; I “discovered” Ari exactly 20 months ago! But it’s a whole long story, not for this time or place). Ari composed this song at age 10, and this features him singing at age 13… what a voice and control even then!!! He superimposed his adult harmony onto it, creating an exquisite rich blend of nostalgia and longing. It starts off with Ari the Kid doing one segment of the song, then Ari the Kid with Ari the Adult doing harmony on top of it, with some great piano arrangements. Then Ari the adult sings on his own, with the kid in the background singing oooh, ooooh, oooh etc. It ends with some great saxophone, followed by the final rendition of the adult and kid, ending in a great high harmony. This song really tugs at your heartstrings… drives me nearly to tears! I rate this an 11!!! Why do you act so small? Playing hide and seek with your soul. Throwing all the meaning of our lives away. It’s refreshing for a change to hear a different kind of English song, and the music is also pretty modern and contemporary. This the most “modern” song on the entire album. I’ll rate this song an 8.5. 7. Oichila. After Aleinu, this is my favorite slow song. It’s extremely moving, and it really brings out the warmth and gefeel that Ari has. The music on it is out of this world; all kinds of different instruments not typically assigned to regular pieces, exquisite piano work, and it really tugs at your heartstrings and transports you into a shul during Yom Kippur. It nearly drove me to tears, I gotta admit. Ari has a real chazzan’s voice. I’ll rate this a 9. 8. Ribon. The song starts off with lively fast music, and then confuses you when Ari suddenly starts singing a slooow chazzanus piece, with his full heart and feeling. Then it suddenly bursts into a loud freilach part, with the choir doing some great accompaniment. Ari composed this is in Far Rockaway as well. It’s a nice, easy listening kind of song, maybe under the more typical category, but pleasant listening nevertheless. The chazzanus portion is amazing; Ari ends it on a really beautiful high note. I’ll rate it an 8. 9. Boiee. Another nice slow relaxing Shabbos song. Not one of my favorites, still nice and uncomplicated listening with a lot of hartz and gefeel, Ari Goldwag Style. Rate another 7.5. 10. Baavoidas, another hora song. (It’s from mussaf of rosh chodesh). Another heartzige hora, but then again, Ari can’t sing anything without his whole heart being in it. Rate this an 8. 11. The album ends with a slow song, an English song speaking of the longing of the holiness of Eretz Yisroel. Very nice lyrics, great tune. (You can see that it’s half an hour to Shabbos and I am rushing to end this review. Lol) The tune sounds somehow familiar, I don’t know where I’ve heard this before. I think I hear Elana on flute in this song. Anyway, I’ll rate this song a 7. In summary, this album is for everyone, not just Ari Goldwag fans. It’s the true musical genius of one person, combining his inner spirituatility with his musical capabilities. Ari really puts the JEWISH into Jewish Music. The songs are not just stam (I told you I’d put you in here, Saar) slapdash words matched to questionably appropriate tunes; the words all speak for themselves and are sung from Ari’s true inner being with his entire soul. Finally, this talented young man is coming out in the public with his musical offerings, and I am proud to be supporting him fully in this venture. Go out and get your copy today!